Noah has a home! 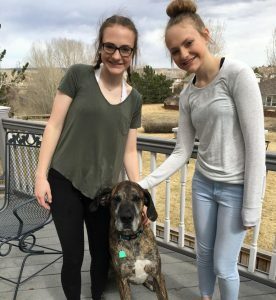 - Rocky Mountain Great Dane Rescue, Inc.
Noah has a home with Mandy & Jon, and their two daughters; Brynn & Tegan, in Parker CO! We met this wonderful family at one of our events here in CO last month after they had just placed an application to adopt. They spent the day talking with our Volunteers, and meeting some of our Ambassador Danes. They just missed meeting Noah, but had seen him on the website, and were excited to get through the application process to learn more about him. Noah has some special needs with his urgency to be let outside more so than a typical dog, and Mandy and Jon did not see that as a challenge.They have the schedule to meet his needs and keep him comfortable, and with two teens in the home, he will enjoy plenty of outside time playing in the yard. Noah has a zest for life, and his energy level is a true testament to that. He will enjoy morning jogs with Mandy, and going to soccer games with the girls to cheer them on! The family plans to take Noah everywhere they go! Noah will be the only dog in the home and will enjoy all the love and snuggle time with his new family! Way to go sweet boy!